Part of my Belfast cityscapes collection. A depiction of Great Victoria Street on the edge of darkness. This central thoroughfare of Belfast is the location of a number of Belfast's landmark buildings such as The Europa Hotel, The Grand Opera House, the Crown and Robinson's bar. Places where tourists and locals alike will meet and merge to enjoy the social side of the city. The colours and textures of the image draw you in and you can almost imagine you are part of the scene. Maybe if you are very quiet and listen carefully you will hear the sound of that famous Belfast craic drifting out from the bustling bars. The Crown Liquor Saloon is Belfast's most famous bar. It is a renowned gem of Victorian gothic extravagance which dates back to 1826. Now owned by The National Trust it has been restored to its former glory. This colourful and vibrant piece of art is composed of a number of images taken on Great Victoria Street where the Crown is situated. The images have been blended in my digital workspace to form an evocative work to celebrate this Belfast landmark. Another representation of the famous Crown Liquor Saloon which is located on Great Victoria Street, Belfast. This is less abstract than my previous image ‘Meet Me In The Crown’ and provides an alternative for those who prefer a more photographic image or more muted tones. I love both the images and would struggle to choose between them. If you are having the same dilemma I can only apologise or suggest you treat yourself to both. This piece is composed from images I captured at the Titanic Quarter. This area of Belfast is home to the Harland and Wolff shipyard where the Titanic was built. Within this image you will find the world renowned Titanic Belfast Museum, Harland and Wolff’s iconic Samson and Goliath cranes which dominate the Belfast skyline and SS Nomadic which was built alongside RMS Titanic in Belfast in 1911. This acts as a reference to the proud history of shipbuilding in Belfast. This image was captured in the midst of the Cathedral Quarter during the early morning hours as the city and its streets emerged from the dawn. This is a peaceful time of day. A very different vibe from what you will experience if you visit these cobbled streets as dusk falls once more and the revellers spill out of the bars and theatres savouring the eclectic nightlife in this vibrant part of Belfast. This is Commercial Court which runs between Donegall Road and Hill Street. Historically it was once the commercial heart of Belfast where pottery, whiskey merchants and an old iron foundry occupied the narrow street. Now it is home to some of the most vibrant nightlife the city has to offer. It is well worth a visit at whatever time of day appeals to you most. 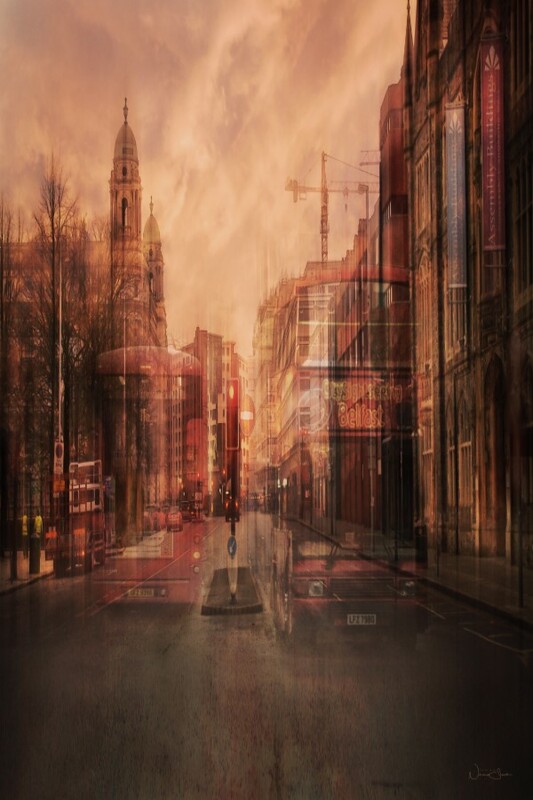 This piece has been created from a number of photographs I captured on Great Victoria Street in Belfast. The tour buses are a common sight within the city centre. I have overlaid and blended the buses into the background image of Great Victoria Street, depicting them as part of the infrastructure of the city. The images within this piece are taken close to the centre of Belfast. They include the Albert Clock which was erected in 1865 in Gothic style to commemorate Queen Victoria’s consort, Prince Albert; and the Jaffe Fountain, constructed in 1874 to honour leading linen merchant Daniel Joseph Jaffé. The fountain sits at the entrance to Victoria Square, a relatively new addition to the area. The central image looks up to the large dome of Victoria Square which forms a 360 degree viewing gallery over Belfast. Within this piece the old merges with the new seamlessly, blending history with architectural innovation. A beautiful piece in muted colours with a flash of yellow from the Jaffe fountain. It would look good in any setting. There are so many faces to a city and so many moods to experience. The images for this piece were captured early on an overcast Sunday morning. I love the peace and tranquility this time of the week brings. Sometimes it can feel as if you are the only person there. The central image is Belfast City Hall with other buildings from the area merged into the completed piece. Belfast City Hall was built to reflect the new city status bestowed on Belfast by Queen Victoria in 1888. It was designed by Alfred Brumwell Thomas in the Baroque Revival style and constructed in Portland stone. It opened its doors in August 1906. Today it is home to Belfast City Council but is also open to the public where visitors can admire the opulent interiors and large art collection. It’s well worth a visit next time you’re in the city. This evocative piece of art has been created from images I captured along the banks of the Lagan as it meandered through the city. This is the final part of its journey from the western slopes of Slieve Croob in County Down to the point where it enters Belfast Lough. A lone vessel bobs gently on the water and to the right stands the Boat apartments and offices. This award winning building, designed by Barrie Todd, is one of the most unique and distinctive buildings in Belfast. The name and boat-like design were inspired by its location on the riverfront. To the left of the image stands the Hilton hotel alongside the Waterfront conference and entertainment centre. The roof of the Waterfront is coated in copper so it will eventually turn green and reflect the dome of Belfast City Hall and other Victorian buildings in the city centre. The regeneration of the waterfront area has been ongoing since the early 90’s and this is now an area well worth a visit with numerous public artworks to view and leisure and entertainment facilities to avail of. This piece of art would provide a reminder of your day in this beautiful city. A birds eye view of Rathfriland, a large market village built on a hill between the Mourne Mountains, Slieve Croob and Banbridge. Where once there stood a castle there is now the iconic water tower built in 1977. The tower, appropriately shaped like an ice cream cone for which Rathfriland is also famous, dominates the skyline. No matter how far you travel you know you’re nearly home when the tower comes into view. There have been many changes in the town over the years but one thing remains constant - the warmth and welcome of the people. Banbridge was named after a bridge built over the river Bann but it’s most distinguishing landmark is Downshire Bridge, known locally as ‘The Cut’. The town began as a coaching stop on the road from Belfast to Dublin and horses with loaded carriages struggled to climb the steep hill of the main street. To solve the problem an underpass was cut out of the hill in 1834 and a bridge built over it, it was quite an engineering feat at the time which resulted in what is perhaps the first ever flyover.